Sometime this year hikers will have a brand-new bridge for crossing Marcy Brook on their way to Mount Marcy and other destinations in the High Peaks Wilderness. The state Department of Environmental Conservation plans to build the bridge about a quarter-mile downstream from Marcy Dam. The old bridge at the dam was washed away during Tropical Storm Irene in August. After Irene, hikers had to rock hop across Marcy Brook at a place known as the Squirrel Crossing. The new bridge will be upstream of the Squirrel Crossing, according to DEC spokesman David Winchell. Winchell said the log-stringer bridge will be constructed this spring or summer. The $20,000 cost (most of it for labor) will be borne by the state’s Environmental Protection Fund. Winchell said no decision will be made on whether to rebuild Marcy Dam and/or its bridge until engineers assess the dam’s structural soundness. If DEC decides to build a bridge at Marcy Dam, Winchell added, the new downstream bridge will be dismantled and the materials used elsewhere. Easily reachable from Adirondak Loj, Marcy Dam is one of the most popular destinations in the High Peaks Wilderness and a stopover on the way to many of the High Peaks. Winchell said DEC needed to install a bridge across the brook as soon as possible. “It’s a busy crossing, and we need something better than a rock hop,” he said. The floods of Irene not only washed away the bridge, but they also damaged the dam, causing most of the dam’s impoundment to drain. The March/April issue of the Explorer contains a debate on whether the dam should be repaired. Carl Heilman, who took the photo to the right, argues for fixing it and restoring the cherished view of a pond nestled among mountains. 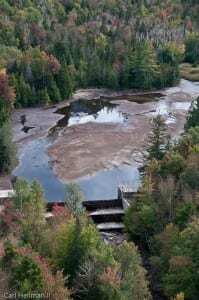 Tony Goodwin, editor of the Adirondack Mountain Club’s High Peaks guidebook, takes the opposite view, contending that the shallow pond had been filling with silt anyway and would continue to fill in if the dam were fixed. Just looks like a pile of money spent on a band-aid. Bet volunteers or the ADK trail crew could build one for a fraction of the cost of this. It’ hard to imagine the hike from the Loj without the dam. I have a lot of fond memories crossing there and I always take the time to admire the view – even when it is fogged-in or snowing. I would be willing to bet that the ADK trail crew is going to build this, and that is why the price tag is $20,000. Note that the article states that most of the cost is labor. There should be no debate on whether to rebuild Marcy Dam and the Bridge. Build it. Marcy Dam holds so many amazing memories for thousands of hikers over the years. Lets build it for future hiking generations so they can have a chance to see the magic of Marcy Dam. Whether or not to rebuild the bridge over Marcy dam is a far more complicated question than most hikers anticipate. One must remember that wilderness is a very important concept in the Adirondacks, and the dam on Marcy Brook was created in the days before this came to fruition. In addition to the structural soundness of the dam, the ecological ascpects regarding the effects of the sudden drainage and supposed subsequent reconstruction of Marcy dam need to be better understood before future plans can be advanced. While asthetics and hiker opinions- as well as the historical roots- of the dam will remain a major factor in the decision making process, these additional factors warrent input and weight in the final outcome. One thing I would imagine we could all agree upon, is that even though the hike from the Adirondak Loj to Marcy Dam is short, the beautiful sight of that pond, with Mt. Colden reflected behind it, was an amazingly uplifting sight for hikers of all ages and athletic levels. It doesn’t matter if you’re a first-time visitor to that area, or a veteran hiker; that inspiring view always puts a spring in your step, (if only temporarily!). It was a perfect setting to take a water break with one of the nicest non-summit views in the high peaks region. Now it is just depressing looking in its’ current state. I’m a hiker, and ladies and gentlemen, I’m there for the views. As an amateur photographer, I totally agree with Carl Heilman’s opinion to rebuild the dam. I have very fond memories of camping at Marcy Dam (even swam there and had campfires). It would be a shame if the DEC did not dredge the pond at this opportunity and repair the dam and reinstall the bridge. What a golden opportunity to restore that beautiful site. The dam is already there are still provides a great service for downstream protection. If the DEC does not restore the dam and bridge, then I would hope they would “restore” the natural beauty of the site by totally removing all concrete and man made materials at the site. In my opinion, that dam is an investment in Adirondacks just as much as the planned building of a new reception center just a short hike away. In fact, I would rather see the dam & bridge restored than see tax dollars spent on a new reception center and parking lot. I would love to see camp fires permitted again also… our children are missing a great experience. A bridge is a man made thing. Too bad the dam will not be repaired. The site is iconic. Our first bear encounter was on that very dam! There are plenty more beautiful dams and vistas for the future though. Memories alone shouldn’t be a reason to rebuild unless it is useful for other reasons. Great point about volunteers building the bridge! I’ve been a long-time trail maintenance volunteer and JBL work volunteer, and I can’t do the technical aspects of construction or BIG muscular work, but I am a hard worker and would love to do whatever I could to help out with a project like this. I think the ADK should seriously consider inviting volunteers and see what happens! There are lots of us willing to work for our favorite park!!! And as far as the concept of ‘wilderness’ is concerned, it’s a nice idea, but I feel that in the 21st century—with even ‘trailless’ peaks having trails, and evidence of humans pretty much everywhere in the park— reconstructing the dam (I call it Marcy Damless now) so that the beauty of the area COULD be restored is a sensible idea. I’ll be doing an SCA trail crew internship this summer in the Adirondacks. I’ll have to mention this to my supervisor! The comments posted here really show that hikers are not necessarily environmentalists. If you care about the environment there is no argument you can make for rebuilding the dam. Yet most hikers seem to want it rebuilt. It’s funny, hikers and snowmobilers are often at odds. Hiking groups often fall back on the environmental argument. Yet here they are clearly making an argument in favor of something that has a negative environmental impact in an area the profess to love. Hypocrisy at it’s finest.